Software giant Oracle filed its proxy statement with the U.S. Securities and Exchange Commission on Friday, documenting what senior executives, including CEO Larry Ellison and presidents Mark Hurd and Safra Catz, made in compensation during the 2012 fiscal year. The filing shows that while Ellison took a token $1 salary, his combined compensation from stock options and other items for the year jumped by 24 percent year on year to north of $96 million from $77.6 million in 2011. Ellison’s compensation package included about $90 million worth of stock options, an $8.4 million $3.9 million incentive payment that was only half one-quarter as large as the maximum allowed under the bonus plan, and a $1.5 million payment for security at his home. Most of the increase can be attributed to the value of the options for 7 million shares that Ellison received. He received the same amount of options last year, and they’re simply worth more this year. Ellison, the company’s founder, who has run it since 1977, already owns more than 23 percent of the outstanding equity in Oracle, amounting to more than 1.1 billion shares. As of Friday’s closing price, his stake in the company is worth more than $37 billion. 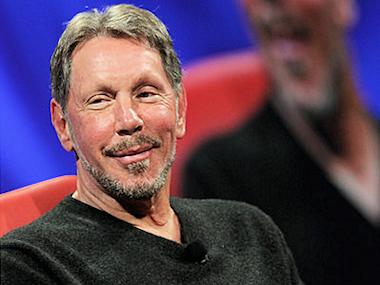 Catz, Oracle’s president and CFO, received a 23 percent raise in total compensation. Oracle reported her combined compensation in salary, stock options and other payments as $51.7 million, up from $42.1 million the year before, including options awards worth more than $48.3 million, and an annual base salary of $950,000. She owns a stake in the company amounting to more than 23.5 million shares, which, as of Friday’s closing price, is worth more than $763 million. Hurd, who joined the company in 2010 after leaving Hewlett-Packard, where he was CEO, saw his total compensation for the year drop to $51.7 million from $78.4 million the year before. The decrease is because of a big one-time bonus in stock-option grants that Oracle gave him when he joined. His base salary is equal to Catz’s, at $950,000, and also included $48.3 million worth of stock options. Hurd owns 5.4 million shares in the company, which, as of Friday, was worth north of $176 million. Hurd and Catz also each received a $2.4 million incentive payment out of a possible $10.4 million. The compensation was for Oracle’s fiscal year 2012, which ended May 31, a period during which the company’s share price fell by 19.5 percent, annual revenue rose by 4.2 percent, and net profits rose by 16.8 percent.